Replacement canopy only. Cushion not included. Metal structure not included. 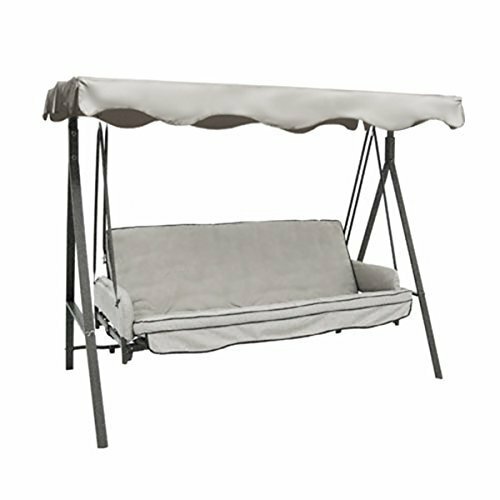 This is a replacement canopy for the lowe's garden treasures three person swing. Original swing model number: SC8844GSN. This swing was original sold at lowe's. Fabric: 100% polyester spun, UV treated, water-resistant, CPAI-84 fire retardant, UPF 50+ protection refresh and rejuvenate your swing with a new replacement canopy. Garden Winds is the trusted brand in replacement canopies for gazebos and swings. Fabric: 100% polyester spun, UV treated, water-resistant, CPAI-84 fire retardant, UPF 50+ protection.